[147 Pages Report] The global fire resistant fabrics market was valued at 3.86 billion in 2015, and is projected to reach 5.27 billion by 2021, at a CAGR of 5.3% from 2016 to 2021. In this report, 2015 is considered the base year and the forecast period is from 2016 to 2021. Fire resistant fabrics are the materials that does not burn when exposed to fire due to their chemical structure. Fire-resistant fabrics are used as the last-level protection barrier in case of direct exposure to fire. They do not catch fire or melt when exposed to fire. This type of fabric can have inherent fire resistance property or can be treated to make it fire resistant. Fire-resistant fabrics are mainly used in apparel applications for personal protective equipment (PPE) in industrial, law enforcement, firefighting, and defense sectors. Maintenance of safety at workplace is a concern for Government authorities. Many government regulations and standards compel the end-use industries to use protective clothing for workers in certain types of work environment. For example, according to the 2010 memorandum of the U.S. Occupational Safety and Health Administration (OSHA), it is mandatory for workers in the oil & gas industries to wear heat- and fire-resistant clothing. Similarly, in other regions such as South America and Europe, such regulations exist which drive the usage of fire–resistant clothing. The growth of the fire-resistant fabrics market is fueled by stringent government regulations for the end-use industries pertaining to workers’ safety. The fire resistant fabrics value chain includes raw material manufacturing companies such as Teijin Ltd. (Japan), and W. L. Gore Associates Inc. (U.S.). Furthermore, companies such as E.I. DuPont De Nemours and Company (U.S.), Kaneka Corporation (Japan), PBI Performance Products Inc. (U.S.). Companies such as, E.I. DuPont De Nemours and Company (U.S.), PBI Performance Products Inc. (U.S.), and Royal TenCate N.V. (Netherlands) are engaged in the production of fire resistant protective clothing that are used in industries including oil & gas, defense & safety services, chemical, mining, manufacturing & construction, and others. This report categorizes the global market for fire resistant fabrics on the basis of type, application, end-use industry, and region. 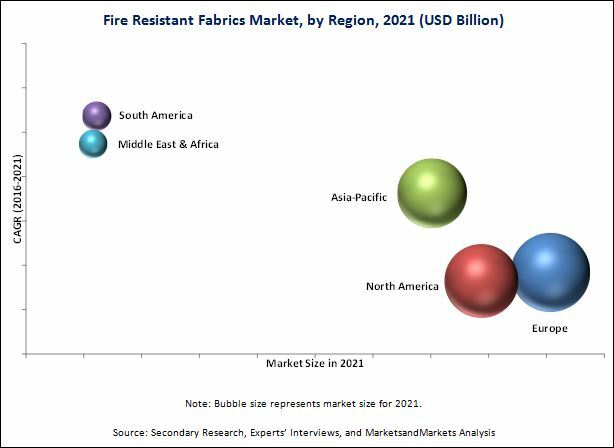 The global fire resistant fabrics market is estimated to be valued at USD 4.07 billion in 2016, and is projected to reach USD 5.27 billion by 2021, at a CAGR of 5.3% during the forecast period. Stringent regulations and standardizations pertaining to safety at the workplace, coupled with the rising demand from end-use industries is expected to drive the global fire resistant fabrics market. Fire resistant fabrics are the materials that does not burn when exposed to fire due to their chemical structure. Fire-resistant fabrics are used as the last-level protection barrier in case of direct exposure to fire. They do not catch fire or melt when exposed to fire. This type of fabric can have inherent fire resistance property or can be treated to make it fire resistant. Fire-resistant fabrics are mainly used in apparel applications for personal protective equipment (PPE) in industrial, law enforcement, firefighting, and defense sectors. The global fire resistant fabrics market on the basis of type is dominated by the treated fire resistant fabrics during the forecast period, followed by inherent fire resistant fabrics. The high growth of treated fire resistant fabrics is mainly due to its low cost as compared to the inherent fire resistant fabrics. The market for inherent fire resistant fabrics is expected to witness the highest CAGR from 2016 to 2021. The growth is mainly due to the rising demand for high performance fire resistant fabrics from the developed regions. The global fire resistant fabrics market on the basis of application, is led by the apparel application segment. The dominance of this segment is majorly owing to the rising demand for protective clothing from various end-use industries. On the bases of region Europe is the largest market for fire resistant fabrics. The leading position of Europe in the global fire resistant fabrics market is attributed to the stringent industrial standardizations pertaining to safety at the workplace. 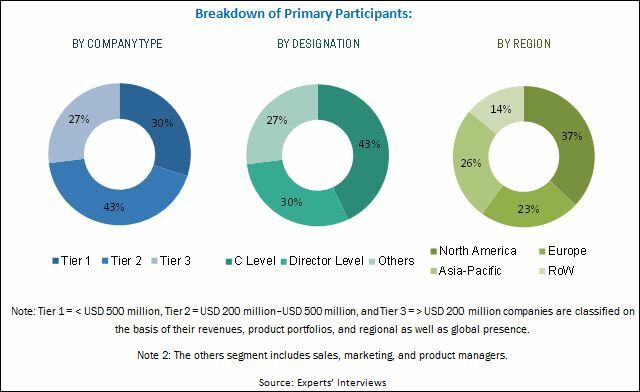 Moreover, the strong footholds of the key market players including Royal TenCate NV (Netherlands), Lenzing AG (Austria), and Solvay SA (Belgium) is fueling the growth of fire resistant fabrics market in Europe. South America is projected to be the fastest growing market from 2016 to 2021. Increasing industrialization and concerns towards safety at the workplace is one of the major drivers of the market in South America. The industrial segment is subdivided into major end-use industries such as construction & manufacturing, oil & gas, and others including chemical and mining. The workers in these industries are often exposed to fire during welding, cutting, nailing, and other jobs. Protective clothing made of fire-resistant fabrics is mainly required for the protection of feet, hands, and head. The defense & public safety services industry from the purview of the fire-resistant fabrics market constitutes of the military, law enforcement, public safety, and firefighting services. Defense & public safety services make up for the second-largest industry for the fire-resistant fabrics market. The transport sector is anticipated to drive the fire-resistant fabrics market in the next few years due to the increasing use of high-performance fabrics in automobile, aircraft, railways, and marine. Recent years have also witnessed developments toward creating attractive design in the interiors of these applications to produce a comfortable environment as well as to provide better safety from fire. In this respect, the fire-resistant fabrics meet the demands in terms of both, safety and design. What are the upcoming product type of fire resistance fabrics? Some of the key players in the global fire resistant fabrics market are, E.I. DuPont De Nemours and Company (U.S.), Kaneka Corporation (Japan), PBI Performance Products Inc. (U.S.), Royal TenCate N.V. (Netherlands), Teijin Ltd. (Japan), Westex By Milliken (U.S.), Gun EI Chemical Industry Co., Ltd. (Japan), Huntsman Corporation (U.S.), Lenzing Ag (Austria), Solvay S.A. (Belgium), W. L. Gore Associates Inc. (U.S.), and others. 5.3.1.1.2.3 Nfpa 70e: Standard Methods of Fire Tests for Fire Propagation of Textiles and Films. 12.4 PBI Performance Products Inc.
12.7 Gun Ei Chemical Industry Co., Ltd.
12.11 W. L. Gore & Associates Inc.